One of the most iconic hotels in the world, Raffles Dubai is a 5-star oasis that elegantly contributes towards the city’s dazzling skyline. Located on Sheikh Rashid Road, a premium business and shopping district, the hotel is close to some of Dubai’s main attractions. Mixing Asian and Egyptian aesthetics, Raffles Dubai boasts sophisticated interiors with a wide selection of luxury rooms and suites available, all boasting traditional handcrafted fabrics, a generous balcony and quality amenities. The hotel’s dining scene is impeccable, with International fare on offer at the in-house restaurants and bars. 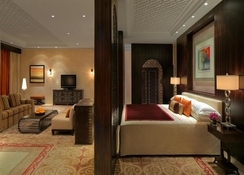 When it comes to facilities, guests can expect no less than first-class from Raffles Dubai. Surrounded by lush gardens, a gorgeous outdoor swimming pool and state-of-the-art gym, guests will be spoilt for choice when it comes to spending time in resort. The rejuvenating Wellness Spa, inspired by Asian, European and Middle Eastern traditions, offers guests a relaxing space to unwind with luxury in mind, with tailor-made treatments sure to pamper. 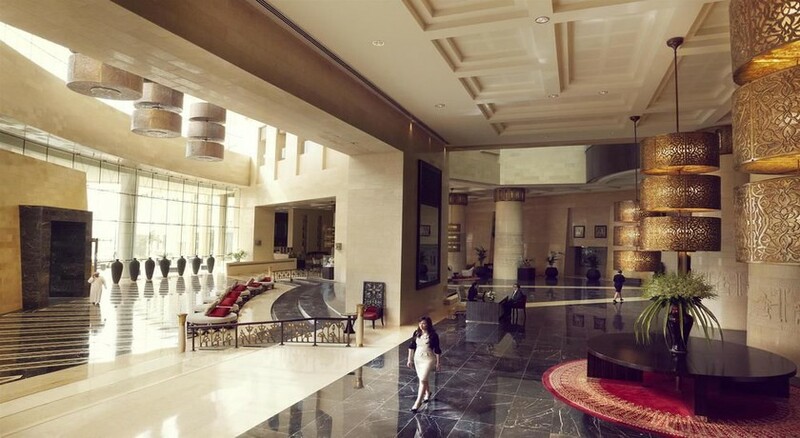 Situated in the heart of Dubai, on Sheikh Rashid Road (a premium business and shopping district) Raffles Dubai is within close proximity to many of the city’s main attractions. The hotel adjoins famous Wafi Mall, an opulent venue bursting with boutique shops, restaurants, souks and even a nightclub. The Khan Murjan Souk is also nearby, and worth a wander if you’re into local culture, plus the Dubai World Trade Centre and Exhibition Halls, and Dubai International Airport. 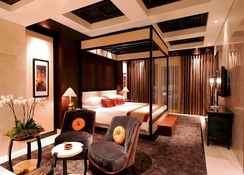 Raffles Dubai boasts a wide variety of comfortable rooms and suites, each dressed with beautifully handcrafted ornaments and fabrics, and boasting a generously sized balcony. Guests have the choice of luxurious Raffles Club Lounge, Raffles Club Rooms, Raffles Club Rooms – Dubai Skyline, Signature Room, Ambassador Suite, Deluxe Landmark Suite, Diplomatic Suite, Dubai Floor, Executive Landmark Suite, Landmark Suite, Penthouse Suite, Presidential Suite and Royal Suite. There is a choice of exceptional restaurants at Raffles Dubai, with seven spectacular dining and drinks venues on offer. Azur, Raffles Garden, Raffles Salon, Solo Italian Restaurant & Bar, TOMO, Crossroads Cocktail Bar and Pool Restaurant and Bar offer a delicious variation of cuisines, refreshments and tasty afternoon tea’s – with TOMO’s Japanese fare crowned as award-winning. In addition, the Wafi Mall also boasts an abundance of restaurants- so guests will be spoilt for choice. 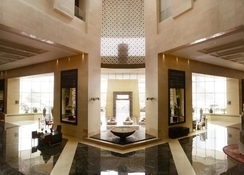 This opulent hotel has an outdoor swimming pool, magnificent gardens, six spectacular spa suites (including a cosy couples suite), state-of-the-art gym facilities, seven restaurants and bars plus a myriad of boutiques, souks, bars and entertainment nearby for guests to stay entertained from morning until night.